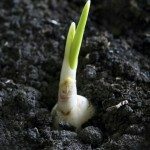 I planted a garlic clove whole, when can I replant the small cloves it produces? Should I replant in the summer or wait until fall? I would wait until early fall. Garlic does best when planted in the fall and harvested in the spring.